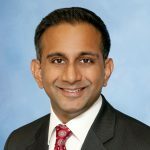 Dr. Hari Nathan is an Assistant Professor of Surgery in the Division of Hepato-Pancreato-Biliary Surgery. Dr. Nathan completed both his undergraduate and medical education with honors at The Johns Hopkins University. He also completed advanced training in health services research and was awarded a PhD from The Johns Hopkins Bloomberg School of Public Health. Dr. Nathan completed his clinical residency training in general surgery at The Johns Hopkins Hospital. He subsequently completed a clinical fellowship in complex general surgical oncology at Memorial Sloan Kettering Cancer Center, where he also served as the Chief Administrative Fellow in Surgery. Dr. Nathan’s clinical focus includes the multi-disciplinary treatment of tumors of the liver, bile duct, pancreas, and stomach. He has particular interests in the treatment of liver metastases from colorectal cancer as well as primary liver cancer (hepatocellular carcinoma and cholangiocarcinoma). Dr. Nathan uses minimally invasive techniques, including laparoscopic and robotic approaches, for both benign and malignant diseases when appropriate. Dr. Nathan’s health services research interests include variation and quality in surgical cancer care, variation in cost of surgical care, and prediction of prognosis after cancer resection.